Jacket: Zara (similar style here); Sweater: Zara (similar style here); Pants: Zara (similar style here); Shoes: Zara strikes again! Things have been pretty non-stop lately -- luckily, it wasn't anything a little weekend recharge up at Lake Tahoe couldn't fix. Our 48-hour jaunt included a much needed movie marathon, wine and watching a light snow fall outside. All in all, it was just what I was hoping for! Wow! Snow...love the pics & the sweater looks soooo cosy! I love your sweater!! lovely coat! That sweater looks unbelievably cozy! I love it! Sounds like a perfect little weekend getaway!! I was expecting one of those weekends too, but I got so sick :( Glad someone enjoyed it though :) Great outfit. I'm so envious of you and your white capris! You look very cozy in this! This looks like such a lovely location! Also your outfit is just perfect...Zara have it going on with clothing at the moment! That sweater is to die for! That sounds so nice!! These pics are amazing. You look so Cozy!!!!! Light snow fall is so beautiful when you do not have to deal with an entire winter full of it! I can't get enough of your shoes! Your weekend sounds amazing! I was at wedding this weekend and have my look up on my blog. so amazing what getting out of thecity can do for your you. especially with the mountain air. Sounds like a perfect getaway! gah! love your shoes soo much!! Beautiful! Love your outfit too! 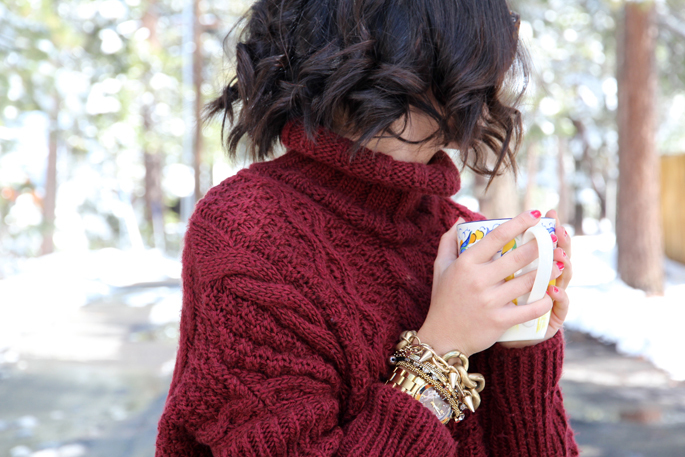 Great chunky sweater, the rich red color is so beautiful. i was about to say- where did all the snow come from?! with 90 degree weather here, snow is actually kind of charming. Looks so cute and cozy! And I am so in love with your hair! You look positively recharged and glowing!! Love the coloour of the sweater !!! Cute outfit. Your sweater looks so cozy. Sounds like a perfect weekend! Great outfit! A weekend away is a great fix for just about anything! This is my favorite post yet, and I've been following for awhile. Sometimes the simplest outfits make the biggest impact, I guess. Also it doesn't hurt that the background looks like a winter wonderland! Love the oversized sweater and the varsity-inspired coat! Great look. love the color of the sweater. So cozy!I feel like I was cheated out of a winter this year. Jealous! Beautiful. Perfect outfit for the cold. I enjoy following your blog, but who wears heels to Tahoe, especially in the snow? What a lovely weekend. Love the colour of that cosy jumper! that sounds like such a relaxing trip!! also love the chunky knit sweater, it looks so comfortable! White is just so fresh and teamed with that burgandy knit makes for the perfect colour combination! Wow this picture is full of cozyness, rock and coolness ! i love the way you mixed the red sweater with with pants and black coat, mixing also the textures. Stunning! oh my! I just loooove this outfit!